A WORLD CLASS RV RESORT! 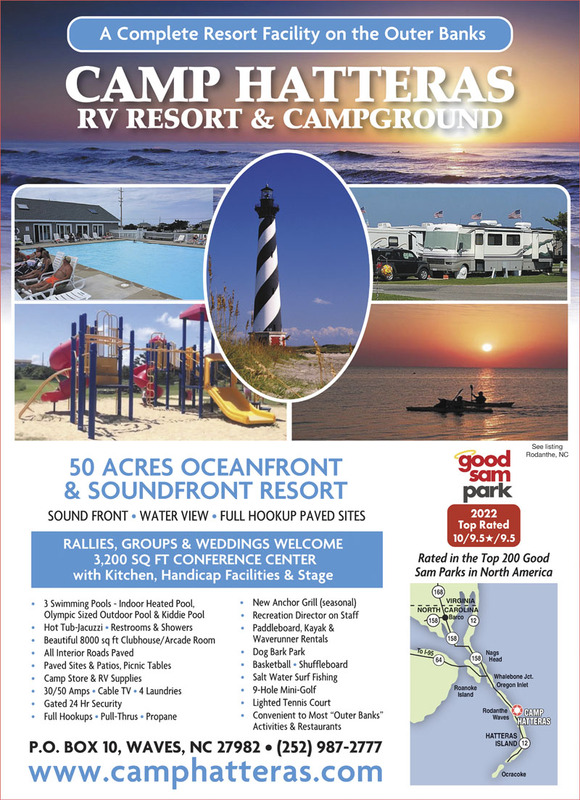 Breathtaking sunsets - beautiful beaches and the only Oceanfront to Soundfront Camping in North Carolina! 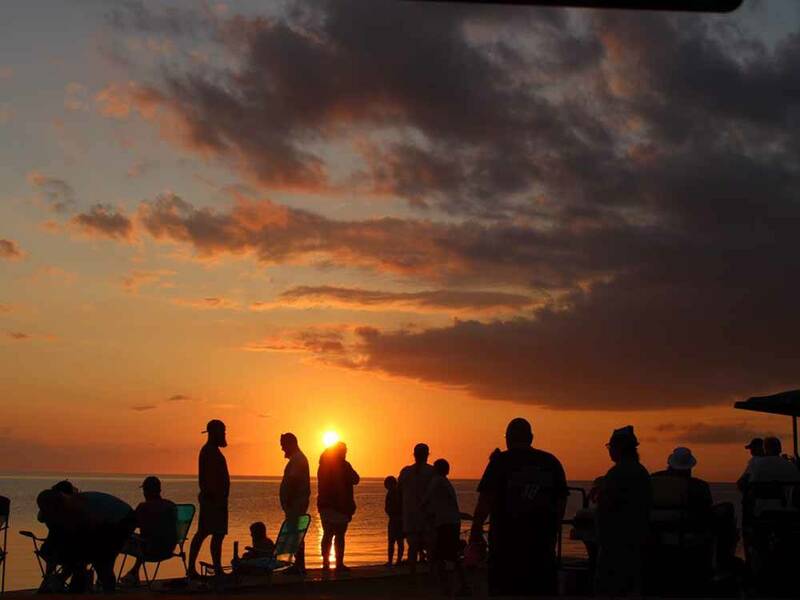 Camp Hatteras - where lifelong memories are made every day! I was looking forward for a week of camping in the outer banks and although it was a good time the campground was not deserving of an overall high rating. The staff was nice but not as friendly or welcoming as most campground I have visited. I'm an outgoing person and like to chat but I received that uncomfortable feeling all week that they had a job to do and being friendly was not part of the job. I felt watched as everyday they came past my campsite inspecting to see if I connected to the cable TV system, for the few dollars it cost per day for cable they should add into the cost of camping and advertise free cable, it would feel like more bang for my buck. I also had to pay extra for my daughter and son-in-law, again include it in the price, I felt I was being up-charged for anything I did. The concrete pads are important but they don't clean the sand off the pads of maintain the area around it. It's a nice campground but not a resort type facility, I expected more for what I had to pay per night. I wouldn't tell you not to camp there but I found other campgrounds in the area that provide a good camping experience but for some it's location and I get that. I Just think management needs to review what a good camping experience should be. Reservations was easy to get at this campground and others was booked up and that should tell you something. We spent Thanksgiving here, and we loved it! We stayed oceanside, just a short walk to the beach. You could hear the waves, even if you couldn't see them. The beach was very nice, and very clean. The sites were a bit small, but nice and flat, concrete pads with a concrete picnic area and nice picnic table. Campfires only in raised fire-rings, so bring your own or buy one there. Wifi not so great, but we were "camping", so it was adequate for our needs. We did not use the bath house, but the laundry was very clean each time we were there. An outside light at the laundry room door would have been helpful. The campground is roughly halfway down the Outer Banks, which was convenient for taking in the attractions at either end of the islands. The staff was quite friendly and helpful. The campground was clean and well maintained. Very pet-friendly, and very quiet at night. We would definitely stay there again!! We decided to ditch the family and spent Thanksgiving in OBX this year. We stayed at this park through the Coast to Coast network and absolutely loved it. The sites all have concrete pads and, while they aren't the largest sites we've seen, there was plenty of space for our Super C. The sites had cable television (nominal extra charge) and the wifi was good around the office, but not at the sites. Wifi at campsites is a bonus in my mind, though - we are, after all, camping. We're looking forward to going back the same time next year! This is a wonderful campground! It is clean, the staff friendly and helpful and campsites well maintained. We were on the beach side, and even though we couldn't see the beach, we could hear the ocean and were just a few steps from it. We rode across to the sound side in the evening and watched the sunset. Magnificent!! Beautiful place. The camp ground is massive on both sides of the road. The ocean side and sound side sites are in full sun. All sites have a concrete pad. The ocean side beach is fabulous, but if you're camping there you can't see it. You can hear it. But there is a large dune preventing any sight of it. The sound side is great you have full view of the water. My biggest complaint with this place is that the sites are more of a parking lot. The sites are extremely small. Once you open your awning it is almost touching the neighboring trailer. The internet is useless. You really can't ever get much out of it.